Please email us your shipping information at doodlebugdesign.blog@gmail.com and put "Home for the Holidays Pixies Winner." Hasn't it been fun to get double the ideas this week with Doodlebug and Xyron? Have you been checking out their blog. We we saved some of the best spooky cute Halloween Parade Pixies for today. And like the other posts this week...be sure to scroll down to see how you can win! Hi everyone! Amanda here with a couple of fun ways to Pixies on your holiday cards. Pixies are made of sturdy plastic and are really easy to cut into custom sized pieces. I created a happy little spider web by trimming black Pixies into various lengths. I started by adhering the Pixies that radiate from the center of the web and then trimmed smaller lengths to make a spiral around the center. 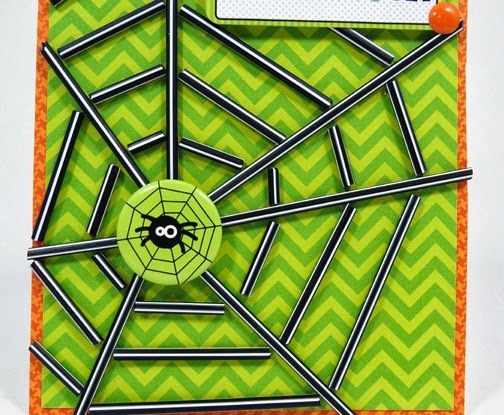 The little spider Doodad flair is the perfect anchor for the Pixie spider web. For my first card I used the Pixies in a couple of ways: as the sprinkles on top of the cupcake and as an outline to the pattern on the cupcake liner. Because the Pixies are hollow in the center, it's easy to hand-stitch them with a needle and thread just as you would a bugle bead! To the cupcake 'liner' I outlined the chevron pattern with pieces of Pixies. And don't forget...you can add your own banners to the sticks or use the assortment packs, which are available in the newest themes. We'll be giving away a set of the new Halloween Parade Pixies and Toppers. Now we want help SHARING these darling ideas - you can PIN, Share on Facebook, Email a friend or Instagram. Leave a comment and tell us what you did...feel free to do ALL and leave a comment for each new entry. We'll announce the Doodlebug winner tomorrow on the blog and offer a new giveaway. And don't forget to stop by the Xyron blog to enter to win some fun adhesive products. Awesome ideas by the DT's , I have shared on my page kalasirjana on FB about the giveaway!! thanks for a chance !! 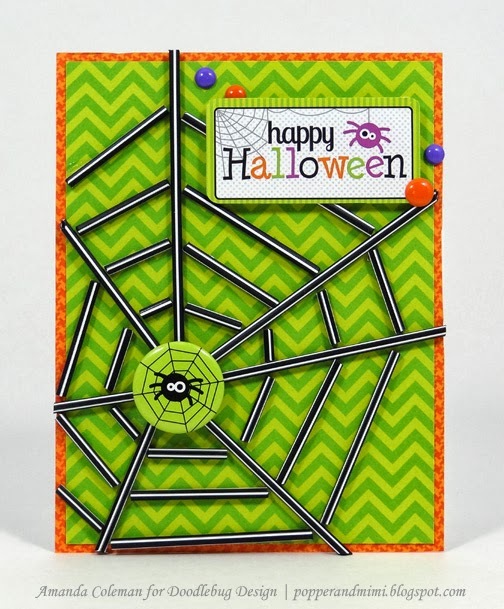 Pinned the spider web card. Love it. Fabulous ideas and wonderful inspiration!!! I shared on Facebook too!!! Love the cards. Hadn't thought about using small pieces as confetti. I don't have pixies but I'm going to get some. they look like a lot of fun to play with. Great wrap up to the week. Some very creatives ways to use Pixies! Pretty creative cards above!!! I emailed some friends. I love the pixie ideas. I "shared," but at the scrapbook store instead of the computer;) Hope that counts. Love these projects - super awesome!! Like the spider web and cupcake!! Genius ideas! Shared on Facebook... Thanks for a chance to win.. The spider web is so creative and fun! I shared and repined. I like the cupcake sprinkle idea! Thanks for the opportunity to win. Yay! Can't wait to play...thanks for choosing me..and that spider Web is darling! oh my! Look at that spiderweb---ingenious! That cupcake is amazing! I shared your link on Facebook! Such adorable cards!! I can take some time out for doodlebug! What awesome ideas for using straws. Great job. Very cute projects! Love the inspiration! Super cute projects, such fun and unique ways to use the pixie sticks!